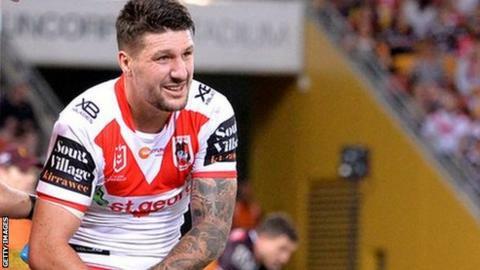 England half-back Gareth Widdop has suffered a suspected dislocated right shoulder for a third time since August. The 30-year-old, who joins Warrington next year, was injured during St George Illawarra's win over Brisbane. He missed the end of the 2018 National Rugby League season and England's autumn internationals after needing surgery because he damaged the same shoulder twice in five weeks. "I'm no doctor but he's uncomfortable," said St George coach Paul McGregor. "You don't ever want to see your captain and playmaker - who has been our best player for a number of years - lying on a bench with a dislocated shoulder. It's sad and part of the game we don't enjoy." Widdop's next possible international action is not until October when England coach Wayne Bennett leads the reformed Great Britain team's tour of New Zealand and Papua New Guinea.